Home → About UCMP → UCMP History → William A. Clemens, Jr.
At a very early age, Bill Clemens became interested in the rich fossil beds that were well exposed near his grandparents’ homestead in eastern Wyoming. Many years later the introductory course in paleontology taught by R.A. Stirton intensified his interest and prompted him to undertake an undergraduate major in paleontology. This led to graduate school and a doctorate in paleontology at UC Berkeley in 1960. After a postdoctoral fellowship at University College, London, he joined the faculty of the Department of Zoology at the University of Kansas and served as Curator of Higher Vertebrates in the Museum of Natural History in Kansas. He returned to Berkeley in 1967 as Associate Professor of Paleontology and was promoted to Professor in 1971. He served as Chairman of the former Department of Paleontology and Director of the Museum from 1987 until 1989. In the following years Bill served as President of the Society of Vertebrate Paleontology (1991–94) and as a member of the Board and President (1993–97) of the California Academy of Sciences. Bill Clemens’ dissertation on the Cretaceous mammals of the Lance Formation of eastern Wyoming was based on extensive collections obtained by the wet screening technique. This work was followed by reviews of the Mesozoic mammals of Europe during several fellowships (including a Guggenheim Fellowship and an Alexander von Humboldt Senior Scientist Award) and sabbatical leave. It culminated in a joint monograph on Mesozoic mammals of the world with his student Jay Lillegraven and Zophia Kielan-Jawaroska of Warsaw. Soon after coming to Berkeley, Bill worked with Mike Woodburne (UC Riverside) to garner NSF support to fully sample some of the mid-Tertiary localities in the Lake Eyre Basin of Australia. In the early 1970s Dave Whistler, a curator at the Los Angles County Museum, invited him to investigate a remarkably rich, early Paleocene site in eastern Montana discovered by Harley Garbani. The following summer Harley, a very talented collector and preparator, introduced Bill to the paleontological riches of the badlands around Fort Peck Reservoir. Almost every summer thereafter, Harley and Bill discovered many magnificent fossils (most are now in the UCMP collections), while simultaneously training many generations of students in field techniques. A number of UC students carried out their thesis or dissertation research as part of this field work: David Archibald, Laurie Bryant, Lowell Dingus, Mark Goodwin, Don Lofgren, and Marisol Montellano. In the early 1980s Bill opposed the uncritical acceptance of the theory of extinction of dinosaurs and other Mesozoic life by meteorite impact. To test this hypothesis he conducted detailed studies of the stratigraphy and biostratigraphy of the Cretaceous-Tertiary faunal transition in Montana and other regions. More recently he has studied the occurrence and environmental implications of dinosaurs and associated fauna on the Arctic slope of Alaska. With Mark Goodwin and others he has taken part in paleontological exploration of the Blue Nile Gorge of Ethiopia where they have discovered Late Jurassic terrestrial vertebrates. His most recent research has been into the microstructure of tooth enamel and its bearing on problems of systematics and evolution of early mammals. He continues work on the evolution of the late Cretaceous and Paleocene faunas of eastern Montana, in collaboration with paleomagnetic and radiometric dating of the sediments by Swisher, Dingus, and Lofgren, and paleobotanical studies by Dr. Nan Crystal Arens and her students. 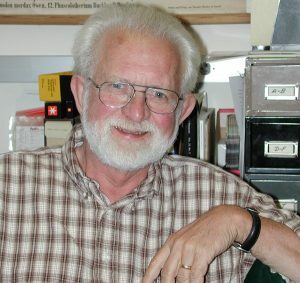 Besides teaching the long established courses on systematics and evolution of mammals, Bill was in charge of the departmental course on evolution and phylogeny for several years and offered the paleontology portion of an interdepartmental course on faunal interpretation with members of the Anthropology department. He has served as major professor for 31 graduate students who are making significant contributions to the field. The two years that Bill served as the last Chairman of the Department of Paleontology and Director of the Museum were tumultuous. The reorganization of the departments of biological sciences was underway. A seemingly never-ending stream of requests for information and decisions had to be dealt with as the Paleontology faculty joined colleagues from Zoology, Botany, and other departments to become members of the new Department of Integrative Biology. Plans continued to develop for the relocation of the Museum to the Valley Life Sciences Building (VLSB). Museum staff and curators were engaged in successfully obtaining support from NSF for new compact storage units and planning the monumental task of moving the collections. Bill retired in December 2002 but is as busy as ever with his research. For more information on Bill’s career and legacy, see the article that appeared in the January 2003 UCMP News following his retirement. From UCMP News, December 1998, with minor additions by Dave Smith, 2008.